Sixteen robotics teams from across the Bay Area gathered in C-120 to participate in MSJ’s second FIRST Tech Challenge (FTC) qualifying tournament, hosted by FTC Team 5151, or Infinity. There are seven awards, recognizing aesthetic appeal to innovation. 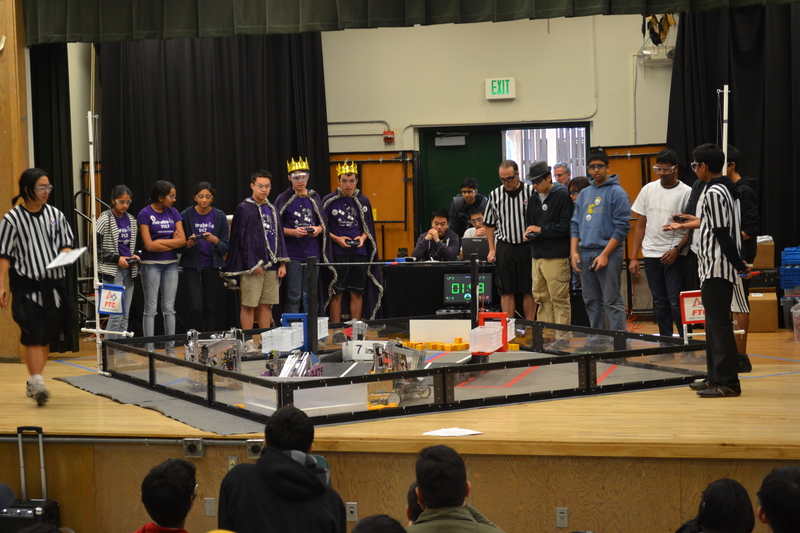 The Inspire award will qualify its recipient to advance to the FTC NorCal Regional Championship. The tournament began with an opening ceremony in which AP computer science teacher Charlie Brucker and Senior Charlie Su introduced the competition. After the captains of each team met with the referees to review the rules and the match list was released, the first qualifying match began. The tournament is composed of two parts, beginning with qualifying matches and ending with the final elimination rounds. During the qualifying matches, pairs of teams are randomly grouped into temporary alliances for each round. Teams are awarded two points per win, one point per tie, and no points for losses or disqualification. Qualifying matches will continue until 4:15 p.m. to 5:00 p.m., depending on how smoothly the previous rounds run. After four matches, the current top-ranking team is Team 5917- Acrobots from Presentation High School and Cupertino High School. Team 5917 is followed by Team 4422- Red HoloRAMS, a community team. Before the elimination matches, new alliances will form based on team ranking when the last of the twenty qualification matches is over. Elimination rounds will continue until one alliance wins two matches, concluding the tournament. Be the first to comment on "11:00 AM-12:30PM: Live Coverage of MSJ Robotics Tournament"